To be honest, I wasn't sure if I was going to make it through another Lucy Maud Montgomery book this year. As I mentioned the other day, I started taking a C.S. Lewis class which has stolen away my reading time. (Not that I have huge objections because it's an amazing opportunity. I'm simply finding myself out of time to read hardly anything else! I'm not sure if I'll be able to meet all of my Montgomery goals this month but I did want to strive to finish The Golden Road while I still had The Story Girl (linked to my review) fresh on my mind. Oh, but I am so glad that I took the time to travel back to Avonlea and visit with the King cousins! 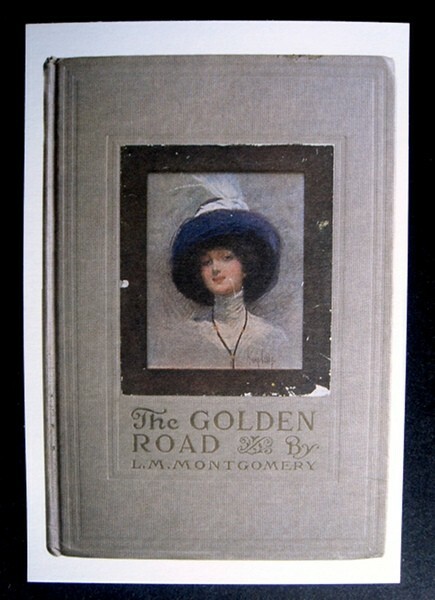 The Golden Road was first published in 1913, and is sandwiched between the publishing of Chronicles of Avonlea (1912) and Anne of the Island (1915). This is the first book she composed as a married woman. I think one of the most interesting things to note in this book is the relationship between The Story Girl and her father, who returns to collect her from her King relations, thus breaking up the happy band of cousins. Maud, it is said, put quite a bit of herself into the character of The Story Girl. Maud's own father left her in the care of her grandparents as she was growing up, traveled west and eventually remarried. Maud never got along with her stepmother and greatly longed for a loving relationship with her father. It's interesting then to note that she allowed The Story Girl the privilege of a relationship with a father who loved her dearly but was not "tied" to any other relationship, excepting that of parent and child. In some ways this book is bittersweet because Montgomery very clearly is drawing the cousins' time together to a close. She hints at what each of their individual futures tell (which I'm certain was helpful in creating the Road to Avonlea television series!) but there are no absolutes to rest in. Still, there are things to love and laugh about when reading along. I believe I got the most chuckles out of the children setting out to make new year's resolutions. Given the time of the year that I'm reading this story again, I found it particularly amusing. "I can't think of any resolutions I want to make," said Felicity, who was perfectly satisfied with herself. "I could suggest a few to you," said Dan sarcastically. "I shall try to be cheerful and smiling all the time," wrote Cecily. "You are, anyway," said Sara Ray loyally. "I don't believe we ought to be cheerful all the time," said the Story Girl. "The Bible says we ought to weep with those who weep." "But maybe it means that we're to weep cheerfully," suggested Cecily. "Sorter as if you were thinking, 'I'm very sorry for you but I'm mighty glad I'm in in the scrape too," said Dan." Montgomery's books make me happy. Every year I say that I should read them all throughout the year and not just in January. Perhaps that ought to be the way because I simply delight in relaxing back with funny, peculiar friends and just being. Indeed, her books leave me with pleasant memories and so I'm not going to say goodbye to these friends. I'm only saying "see ya later!" This one is unfamiliar to me, too. I've thought a little bit about which LMM books to read once I get through the Anne ones. Maybe these would be good so I'd be familiar with the Road to Avonlea people if I ever watch that? You are so cute, Carrie. I mean that in all seriousness and not at all patronizingly. I think this is one I'd really enjoy revisiting. I've judt about decided I like the LMM books about children the best (this said after coming off A Tangled Web). I really need to do my research on the Author, because I never knew she had other books beyond Anne of Green Gables Series and Anne of Avonlea that were as known as they seem to be, or that they existed at all. I was recommend The Blue Mountain earlier in the year, so now I'm going have to check this and The Story Girl out too - and get the rest of Anne of Green Gables series.